So sometimes I get an idea and start a project. And then sometimes I don’t follow it all the way through. This is one of those times. Not to say that I didn’t accomplish anything, because making this raised garden bed from a pile of wood and some nails felt pretty good. Just because I didn’t actually fill it with dirt or a garden after installing it doesn’t necessarily make it a failure, it just makes it a work in progress. Living in the city, I don’t trust the soil to grow edible things. Digging around in my yard, I’ve found about a zillion rusty nails, cans, scrap metal, plastic pieces and various other non-compostable items. And whenever it rains, it seems that there is a new layer of broken glass pieces that surface from underneath. So this spring (yes, like 5 months ago) I decided I wanted a veggie garden and decided to make my own raised bed to have in a section of the yard. 1.) 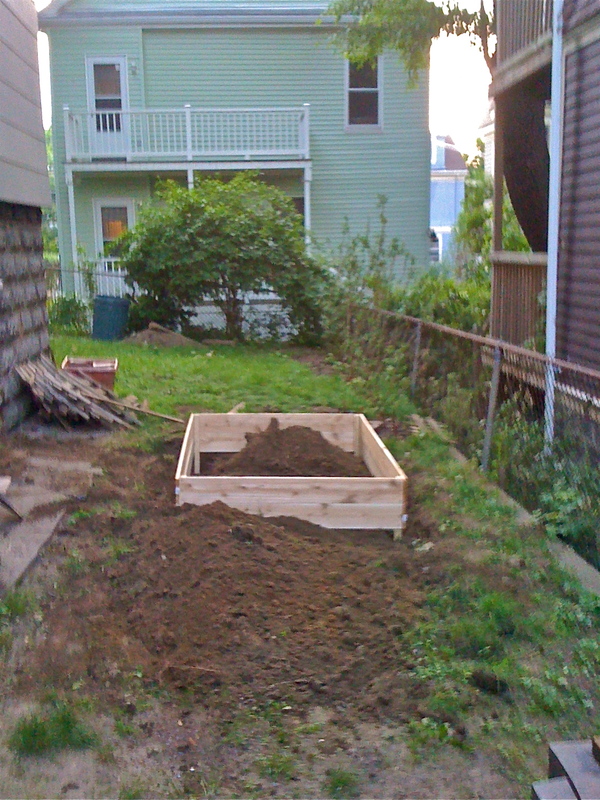 Decide how big of a raised bed you want/can fit in the space you have. I had a few options in choosing the space I wanted to utilize in the yard for my garden bed, but wanted to place it in an area where it had the best chance of being successful. I studied the amount of direct sunlight each part of the yard got throughout the day and placed the bed in the area where it was likely to get the most sun. I also constructed it large enough to house a few different varieties of veggies but also so that it was manageable to maintain and tend to. A 6-foot by 4-foot bed seemed to be the right size for this project. I purchased the materials for about $40. 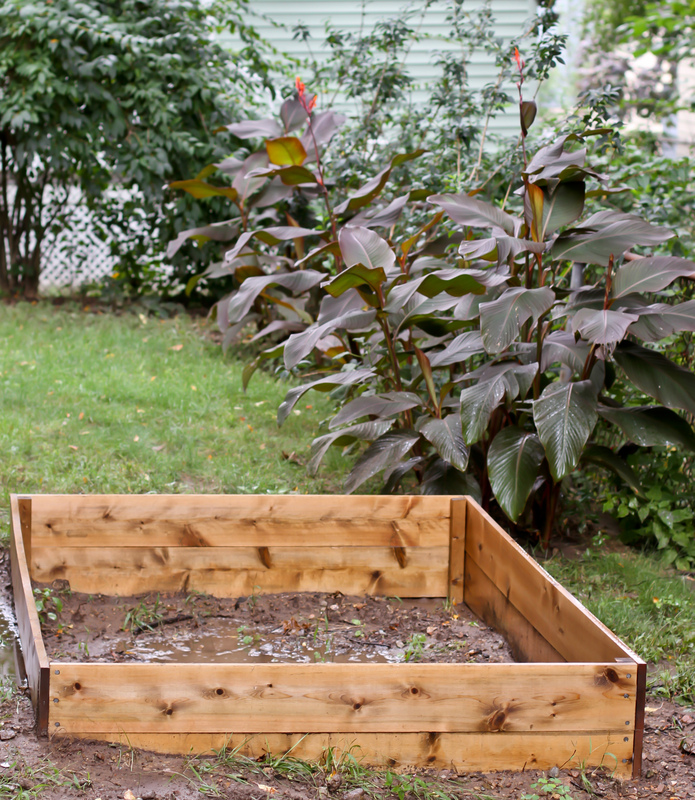 Pretty inexpensive for an awesome garden bed. It was important to buy untreated wood so that the chemicals didn’t seep into the soil, so I got some untreated cedar boards. Four 8-foot long boards and two 6-foot long boards for the sides and an 8-foot long 2×2 to cut and use as stakes to firmly plant the finished product into the ground. I cut the two 8-foot boards in half for the width portion of the bed. I then cut the 8-foot long 2×2 into 2 foot sections, and made one end on each of them pointed to that they would stake into the ground easily. 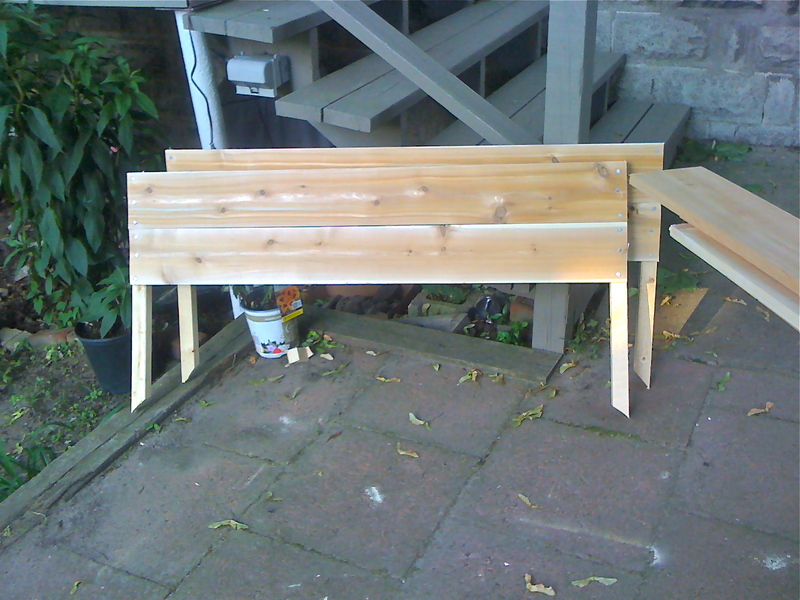 I then used six nails to attach the first of the boards to the stakes, and started building out the frame. 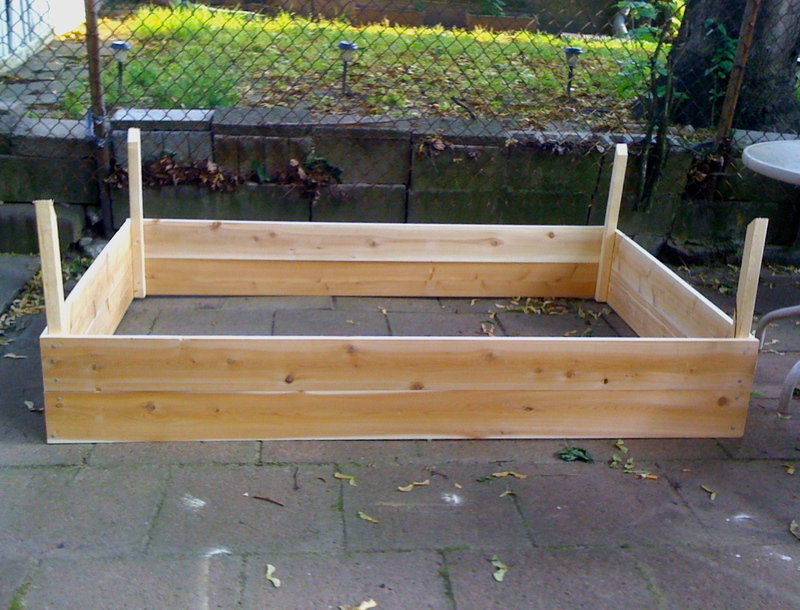 I then repeated the process until the ends of the garden bed were assembled. 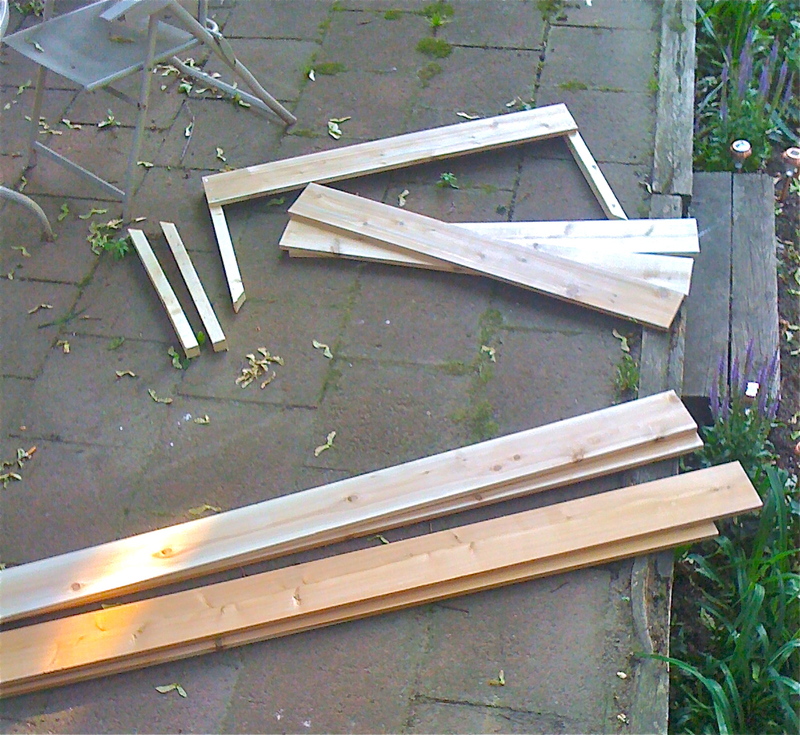 Next, I nailed the longer 6-foot boards to the stakes to finish the assembly of the garden bed. 3.) Installing the garden bed. 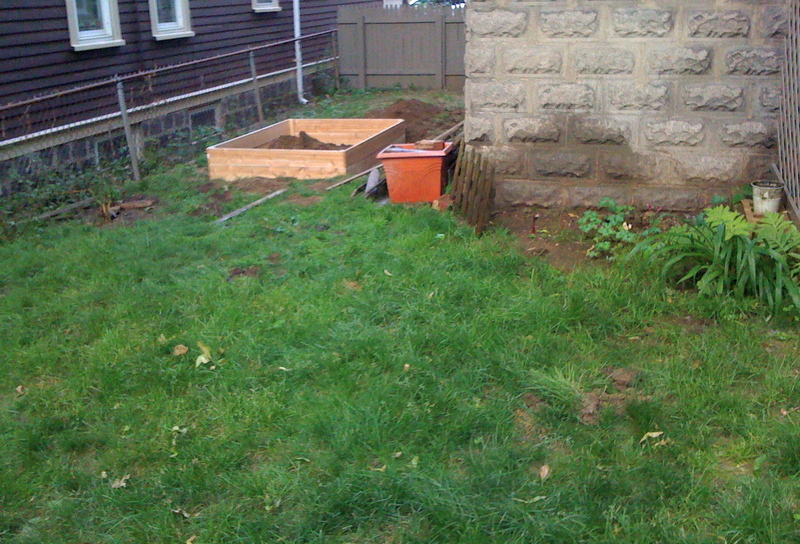 Once construction was completed, I cleared an area in my yard a little larger than my garden bed. For best results, it’s always a good idea to dig down into the soil where your bed is going to be placed to uproot and dispose of any growth that is already in the area. This will also aid in draining for your garden and will help to reduce the number of weeds you get in your first year of growing. 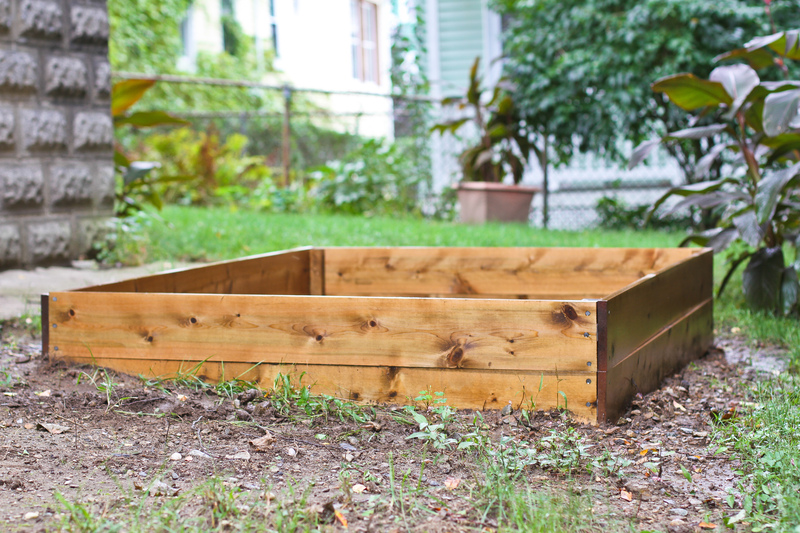 Once the area is clear, securely plant your garden bed bed into the soil. Be sure that it is level. My yard is on a slope, so I had to dig one end of the bed deeper than the other to be sure I had a level growing area. 4.) Prepare soil and start growing. This is the part of the process I didn’t complete. But I would imagine you fill the bed with soil and then add your vegetable plants, resulting in an awesome garden. It does take a good amount of soil to fill the bed, and I was planning on having some delivered, but never got around to it. Before I knew it summer was almost over, and the growing season here in New England was coming to an end. I do plan on using this next year however, and am excited about my growing possibilities. Before adding the new soil and compost mixture (for a nutrient rich growing field), it’s a good idea to cover the bottom of the bed with newspaper or a weed stopper sheet to prohibit growth of unwanted weeds and plants up into your newly planted garden. I did get a backyard composter recently, and hope to have some nice organic material to add into the soil once the coming winter has ended. I’m sure there are some plants that might benefit from being planted in the soil now (garlic, maybe?) but I still haven’t gotten around to getting that soil delivered. I think for the fall/winter, I am going to build a mini greenhouse using old windows so I can attempt to grow some things during the colder months. Maybe this time I’ll actually plant some things in it as well. ← Urban Exploring: Rural Edition. Thanks for posting this. Really great information on greenhouse gardening.